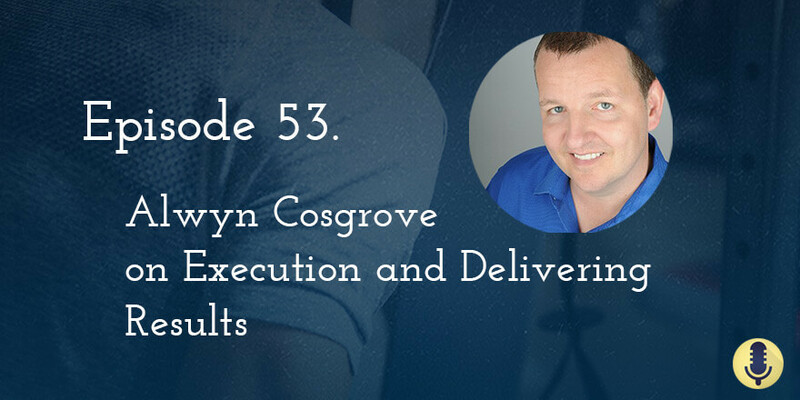 Alwyn Cosgrove came on to discuss training strategy and program design, and especially some of the most absurd trends in the industry. Key themes were about delivering real results, relentlessly cutting chaff and extraneous fat, getting to the real core actions that will deliver results, and doing those things incredible well. A lot of what Alwyn does with business consulting has to do with lifestyle design — that is, thinking about why you’re running a business, and how you’re going to structure that business to accomplish those goals. You don’t want to work for the sake of work, and if you’re not pro-active, that’s where you’ll happen. There was also a discussion about the benefit of the benefit. It’s not about losing a number on the scale; it’s about the benefit of that, or the “and then what?” or “why?” Keep digging. Why? And then what? Oh, why is that? That’s how you get to the real deep-seeded beliefs. This is good for marketing… and for coaching! The “and then what?” and lifestyle design equation come together when you think about why are you training. If you feel exhausted and terrible all the time, you’ve probably gotten lost somewhere. Go back to the why. In terms of marketing, and dealing with the people out there offering absurd promises, Alwyn says there are only two defensible positions in terms of marketing: “You were the first, or you were the only.” That is, Alwyn positions himself in a category of one. His clients won’t find someone else with the same background, expertise, and proof as him. They just won’t. Both Scott and Alwyn agreed that expertise is about simplicity is key. Expertise is often about getting rid of the extraneous stuff, not about adding complexity. This is true of coaching, and marketing: do amazing stuff, and do it well. Execution is key, not bells and whistles. Do simple things, and execute. A problem is information overload. If your coach gives you an opinion, guaranteed within five minutes you can find an article or something that can seem fairly legitimate that says the exact opposite. Always. For both sides. Alwyn sometimes uses a rule with clients: you’re allowed to question anything I say, but you’re not allowed to go out and just Google it and question. It used to be hard to get information. When Alwyn was writing about creatine way back when, he had to write a letter to the actual researchers. Now you Google it and have to sift through endless piles of crap. Sure, there’s more good stuff, but there’s exponentially more chaff. Another problem is the outright lies and supposedly legitimate research taken out of context. E.g., a supplement company pays for 10 studies. Nine of them show nothing. One of them shows maybe… sorta… something. Well, they don’t talk about the studies that didn’t show anything; the just build up and build up the study that was vaguely a little better than inconclusive. A similar problem, beyond supplement companies, is that journals don’t like publishing research that shows a negative result: “We were trying to show this, we didn’t.” The study design is valid, and it’s good for us to know such-and-such doesn’t have a positive effect. But it’s hard to get funding or published for producing that kind of result. Take your fitness business to the next level at Results Fitness University. Alwyn’s blog. Not used much!